A lot of the discussion of Sound Transit 3 (ST3) – the transportation expansion package you’ll see on your November Ballot – has centered around regional mobility. ST3 will deliver a lot of value for the region, but what Seattle is getting can sometimes get lost in discussions about Everett and Tacoma. Seattle is only paying for Seattle projects, so let’s look at what Seattle gets. What is in a number? In the case of the $54 billion price tag for ST3, quite a lot: Inflation, federal funding, fares, and extending existing taxes that already don’t sunset for 1-2 decades. Breaking it down to new taxes in 2016 dollars for Seattle – ST3 is approximately $4 billion in Seattle, spread out over 25 years. That is still a lot of money, but ST3 brings massive value. What do we get for that $4B? The proposed Green Line isn’t just about Ballard. It will give Queen Anne and South Lake Union the downtown connection they need. It will connect Northwest Seattle to the Rainier Valley for the first time. Compared to RapidRide, it will be three times faster, far more reliable, and more frequent. In the 35 minutes it takes RapidRide D to get from Market Street to Pioneer Square, a Green Line train will already be in Rainier Beach. Repeat this to yourself a few times: vote yes, and once it opens you’ll never get stuck in traffic again. The Green Line will be a blockbuster for ridership, with a high-end estimate of 144,000 rides every day. That is more rides than the population of Bellevue and higher ridership than the entire 60 mile Portland MAX system. It connects growing neighborhoods where people live and work with truly world-class transit. A new downtown tunnel will connect South Lake Union, Denny Triangle, Lower Queen Anne, Madison Street, and the International District. The elevated extension to Ballard will serve up to 10,000 Expedia employees in Interbay, East Magnolia/West Queen Anne, and of course, fast-growing Ballard itself. This line will mean a 14 minute trip from Ballard to Westlake or 11 minutes from Ballard to South Lake Union—every time. Beyond connecting the Junction, Avalon, and North Delridge, the Red Line is all about revolutionizing transit coverage and reliability across the West Seattle Peninsula. 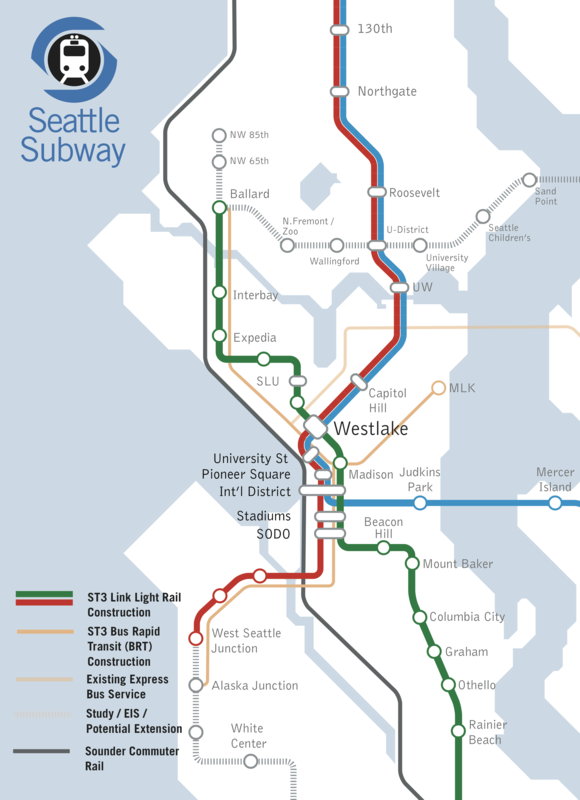 The line would give West Seattle a fast connection to Downtown (12 minutes), Capitol Hill (19 minutes), UW (23 minutes), and Northgate (30 minutes). Easy transfers at Sodo or International District would open up a world of transit trips that are inconvenient at best today: West Seattle to Ballard, SeaTac Airport, or Bellevue. The massive bus hours currently spent moving people between West Seattle and increasingly congested downtown streets could be redeployed to bring better transit service everywhere within West Seattle. For instance, voting Yes on ST3 also helps bring RapidRide to Alki, White Center, and another line to Burien. This means better coverage, frequency, reliability, and forever saying goodbye to getting stuck on the West Seattle Bridge. Some of the most passionate advocacy we’ve seen during the ST3 development process came from boosters of these two stations. Graham Street Station will mean urban stop spacing through the Rainier Valley, plugging a key coverage gap. 130th Street Station will mean better bus transfers for fast growing Lake City and Bitter Lake and will be a key site for transit oriented development. Move Seattle paid for part of Madison BRT but ST3 will pay a larger portion and set this project up to begin work. The Rapid Ride C/D corridor will also see major investment in the near term to improve bus speed and reliability while the rail lines are being built. ST3 implements a new policy for Sound Transit that requires that 80% of disposal properties (properties around stations) will be for housing and 80% of that housing must be affordable. This is a much higher requirement than the policies that preceded the Capitol Hill Station Agreement. Here is a regional/Seattle upside to ST3 that has been getting minimal press: ST3 includes $518 million for local schools. All of the gray lines on our map are funded for study but can be built as part of ST3 if additional funding becomes available. Sound Transit is counting on 11% of the package to be federally funded. Passing ST3 will put us in first position nationally for federal grants and both presidential candidates have said increased infrastructure spending is a priority. Investing in infrastructure projects is one of the very best ways to increase stability of the local economy and social mobility of its workers. ST3 is projected to create 223,000 jobs. This ensures family wage jobs in the region for decades to come, building essential infrastructure to keep our economy humming through ups and downs. What about those long timelines? As we have covered before, seamless local collaboration by cities and avoiding political roadblocks during the environmental review (EIS) process could open the door to faster project delivery. We could see a 3-5 year reduction in timelines on lines to Ballard and West Seattle. The federal government is likely to increase transit-related grants and loans to provide Sound Transit cash flow earlier than anticipated. Check out our timeline slider chart to see what adding federal funding and speeding up the EIS could mean for projects in the region. It delays construction a minimum of four additional years (Sound Transit focuses on presidential elections when there is maximum participation). This adds years of commuting misery and leaves billions of federal dollars on the table by not having approved, shovel-ready projects ready now. Meanwhile, Sound Transit would lose a highly effective and specialized workforce assembled over the years, slowing our ability to rapidly turn around quality projects. A future package would also accomplish less, creating some hard choices between neighborhoods in dire need. Seattle would likely have to pick between service to Ballard or West Seattle; there won’t be enough money for both. It could also mean streetcars running up 15th instead of the quality that brings Seattleites out in droves. This outcome leaves our region, already behind on transportation, at risk of losing our economic vitality and quality of life. In 1968, voters had the chance to fund a 49-mile rail system with just $24.42 per year in property taxes on an average $20,000 home. They balked, and we were left with a brittle transportation system that breaks down during every peak commute. With every year that passes, the situation gets worse, and the solutions more expensive. Now we are faced with an opportunity to fund major improvements to our transportation network for $169/year for the average voter. Let’s not repeat history. There is only one way to bring Seattle high quality transit as fast as possible. And it all starts with a Yes on your ballot for ST3 (Regional Proposition 1) in November. Yep, almost everything for Seattle almost nothing for the South King County. The title of this article is “Why Seattle Should Vote Yes on ST3″. Emphasis mine. I’m sure that there will be an upcoming article with all the highlights for S King. Off the top of my head, S King is getting increased Sounder service, 518/405 BRT, a smattering of light rail stops, and lots more parking (though I consider that last part a demerit). S King is getting the most of what it can afford subarea equity blah blah blah. Typical Seattle Subway garbage. I think they turn more people off of ST3 then they help bring onboard..
They’re turning me off, at least, by not interacting at all with my or Ross’s objections. You decided a long time ago to vote No. What’s left to turn off? $102 million will be spent to add shoulder lanes on 167 for busses. How do you get 40% increase. I thought Sounder south is running 8 car trains. Eight to ten is 25%. Is it seven to ten, a 43% increase? He may be including the capacity increases allowed for by the additional 3rd track, frequency increases and additional span of service. Adam, SR 518 & I-405 do not address the needs of most South King residents. 405 is in the East subarea. 518 is at the fringe edge of the South subarea, like saying that a Lake Forest Park – Shoreline route is beneficial to people in Seattle. Technically, it is in your subarea, must be beneficial to you. Good points, Steve, RE: Sounder. But S 272nd is ST2, not ST3. Shoulder lanes for buses: you’re kidding, right? That actually has to be a joke. Seriously? What next? Grants for mopeds? … but anyhow, let’s stay on topic. Tons of wins for Seattle. Tons. Tons. Why is shoulder running buses a joke? Shoulder-running buses is questionable because shoulders are supposed to be a safety feature. There are already shoulder running buses on I-405. They aren’t allowed to run faster than 35 MPH so they have time to switch lanes if a disabled vehicle is in the shoulder. Presumably, the same would be true on I-5. I don’t think it’s particularly dangerous given all the restrictions they place on it. Plus, buses have been running on the shoulder even longer in some other parts of the country, like Raleigh-Durham, NC. South King is on the receiving end of several other projects, such as the 167 to I-405 carpool interchange, the continuation of 167 to I-5 with 5 new on and off rams around Edgewood, Milton, (2) Fife and the port of Tacoma, and I-405 Widening. Also a 509 interchange with I-5 just south of the Airport. First off all, when you have a transit network improvements to one area (especially if demand for travel to and within that area is high) translates to improved transit for the other areas. In this case folks in S. King regularly travel to and within Seattle. Where were you when ST was deciding the South King projects and asking for public input? South King gets nothing… except light rail to Federal Way which South King said repeatedly was its far highest priority. And longer Sounder platforms and — if negotiations with BNSF go well — hourly trains. And BRT between Renton, SeaTac, and Burien. What other regional transit does South King want instead? I can think of one thing, an all-day express between Kent and Seattle, but hourly Sounder would address that (although I’d prefer half-hourly). But the question is not what I want but what those living in South King and leaning against ST3 want. Metro’s long-range plan will also address many of the remaining transit gaps in south King County, with two routes between KDM Station and Kent Station (one RapidRide and one Express, both on KDM Road which is faster than Reith Road. But Reith Road gets another RapidRide.) And another RapidRide on the 169/180 corridor (Renton-Kent-Auburn). But all these and others assumes ST3 passes; without it Metro will have only enough hours for some of the new routes. That’s still biased in ST3’s favor. Metro has no hours for the new routes currently, and reinvesting all the ST3 corridors’ hours wouldn’t come near getting it there. Whether or not ST3 passes, it may or may not go to the voters for more funding, which it may or may not get. The only relation is that if ST3 fails, Metro would also need even more money to serve the ST3 corridors. How much more? We don’t know. That new bridge for West Seattle: while the current plan has this being a short light rail line essentially shuttling passengers from West Seattle to Sodo, this could be much bigger. Imagine if this thing were built like the Tillikum Crossing in Portland, that would allow both buses and light rail to use it. Now, the first stage is bus only on its own dedicated bridge, with light rail coming later. This avoids the double transfer penalty. Then, when the time is right, light rail trains are added. However, the buses are able to continue across the bridge and connect West Seattle with a number of other places outside the light rail line. If you look at the Seattle Transit Map elsewhere on the web site, there appears to be quite a lot of utility to having both buses and light rail trains cross this bridge. The key, of course, is to build the WSTT. Once you do that, other pieces fall into place. Add the ramp meters and a ramp connecting the West Seattle freeway to the SoDo busway. The connecting ramp could extend far enough to avoid the SR 99 weave, or if not, be designed so that it could be a future enhancement. That would give you grade separation from West Seattle to the Ballard Bridge (or beyond if you built a new Ballard Bridge). The key, really is to future proof the WSTT and enable rail to run in it later (as was the case with the other tunnel). That would mean we would still need to build a brand new rail bridge, but given the fact that the other investments (in bus infrastructure) to West Seattle are fairly cheap, it wouldn’t be much of a loss. Even if buses are completely kicked out of the tunnel, i could still see buses using the bridge and the SoDo busway ramp. The 50, for example, would still make sense and make use of that route. You’re much more optimistic about the pro-everyone must sit in SOV traffic crowd allowing the bridge lanes to get fixed than I am. If marginally pro-transit Ross is unwilling to go along with a plan supported by the overwhelming consensus of the transit community (Regional Proposition 1), why would we expect lots of people even less interested in quality transit to give up HOV and SOV right-of-way on their commute bottleneck? We’ve seen the politicians turn tail and run on the effort to even have HOT lanes on I-405, despite the data showing the lanes are helping. Some of those calling for BRT instead of rail (at least until rail is no longer on the ballot) even celebrated the victory over the HOT lanes. Ross is swimming alone against all sociological and historical evidence that his plan is politically impossible. Plus, no agency has expressed interest in this plan. It isn’t happening. It’s little more than an idea on a napkin. Let’s grasp the opportunity before us to do much better, and vote Yes. The bus lanes on the West Seattle bridge work fine as-is, no bridge expansion required. It seems a little weird, but they are quite functional and the SOV weaves don’t seem to impede bus flow at all. The problem is the exit ramps which have no bus lanes. If the viaduct’s Seneca offramp was going to exist in perpetuity, I would argue for expanding the circa-1953 single-lane ramp from the eastbound bridge to northbound 99, which currently can add 5+ minutes to an inbound rush hour trip, but without knowing what effect viaduct removal will have on bus routes and traffic patterns, I can’t support any expansion. West seattle buses might end up moving off of 99 entirely, in favor of 4th or the Busway. The current bridge traffic is with the current population. When a million more people move to the region traffic will get worse, just as it’s worse now that it was twenty years ago. Ross is in an unusual group because he’s both transit-knowledgeable and a skeptic of this West Seattle proposal. But there has been more than one person in West Seattle clamoring loudly for “Light rail now!! !”, which more than cancels it out. We’ll see if this pro-West Seattle LR support base vanishes by November. I’m guessing it won’t. They must surely know that they’ll have to transfer if they’re currently on the 21, the southern part of the C, or the peak-only 55. But they won’t have to transfer if they’re on the 120 because both Metro and Seattle have designated it for RapidRide and a continuing one-seat ride to downtown. The plan is for buses to remain on 99 between Spokane Street and Columbia Street. The waterfront plan has transit lanes between Jackson Street and Columbia Street although it’s not 100% certain they’ll remain. Rerouting the buses would require a leap Metro and SDOT have not at this point acknowledged as worthwhile, and would waste the investment in the transit lanes (if they appear). Are we talking about West Seattle still? They really don’t have to give up much of anything. The only change for SOV drivers is that they get ramp meters. HOV drivers might actually gain something, in that they would get to pass through the meters as well. If you added the ramp and lane as described, everyone actually gains, as you have a lane which doesn’t require a weave. You go from this: http://s3.amazonaws.com/stb-wp/wp-content/uploads/2015/07/14212200/WestSeattleExisting-650×317.png to this: http://s3.amazonaws.com/stb-wp/wp-content/uploads/2015/07/14212356/WestSeattleNew-650×324.png. As L. T. said, maybe that isn’t even necessary. But if you did add that, it would mean grade separation for all the buses, and a smoother drive for most of the cars. They must surely know that they’ll have to transfer if they’re currently on the 21, the southern part of the C, or the peak-only 55. But they won’t have to transfer if they’re on the 120 because both Metro and Seattle have designated it for RapidRide and a continuing one-seat ride to downtown. My guess is they don’t know anything of the sort. When you have vague promises, such as those suggested by ST3 as well as Seattle Subway (“The line would give West Seattle a fast connection to Downtown (12 minutes) …”) it sounds great to everyone. But either you truncate bus service, or you are going to have extremely low ridership. There just aren’t that many people in the junction (or the other stops). So, yes, I do think you will truncate the bus service, but it wouldn’t surprise me if people really haven’t figured it out. People associate grade separation with light rail, and RapidRide with delay. What they haven’t done is the math to figure out whether it will actually be faster to their home or not. At night I can’t imagine it would be faster, because there really is no congestion on the West Seattle freeway then. Are buses supposed to wait for them in the junction (Mercer Island style)? What exactly is the frequency of both, anyway? It is easy to assume that it will all work out, but ST has no history of even considering bus to rail interaction, let alone pulling it off properly. ST is very vague about the subject, and I don’t blame them. Here is one possibility. The pylons for the train take up a couple of the lanes that are currently bus-only around the junction. With both kiss and ride and unofficial park and ride around the station the norm, traffic is really bad around there. The train runs every ten minutes, as do the buses. But with heavy traffic, it is impossible to time, and no one attempts it. Thus there is penalty roughly equal to half the frequency of Link, or five minutes. You also have the extra time to get off the bus and walk to the platform (a couple minutes). Of course if you time it wrong, there is a bigger penalty, or over ten minutes (if the train leaves while you are walking up the stairs). This means one of Martin’s favorite arguments for 100% grade separation (reliability) pretty much goes out the window. Yes, if you walk to the station you know exactly when you will be downtown. But if you — like most of the riders — arrive by bus, you may be an extra ten minutes late (worse than you would be today). Like most of ST3, it fails to consider the overall network, and the result will be something that has as many losers as winners (with truncation) or extremely low ridership (with low headways to follow). That’s possible, but at this late point when they’re contemplating their vote, if they want to ride it you’d think they’d be curious about how close the station is and glance at a map rather than just assuming it will stop three blocks from their house. Ross, there is no plan for North King to self-fund another downtown transit tunnel. By allowing unworthy-to-bypass-gridlock Snohomish, East King, South King, and Pierce to partake of the light rail bonanza, their subareas are helping to fund the second transit tunnel. There is no plan for Seattle to self-fund a second transit tunnel. It isn’t going to happen that way. The original downtown transit tunnel was funded by the whole county, or it would never have happened either. North King is getting the best deal it will ever get for a Sound Transit package, and its now or never for 130th. is sadly off. I think most of the pro-ST3 votes in West Seattle are from SOV drivers hoping incorrectly that it will cure their congestion on the WSB and SR99. Since the vast majority of those of us who actually already use transit from WS (and will continue to use it) do not live in walking distance of the junction, we know that it’ll make our long ride above Sodo basically less bouncy but altogether slower and less convenient than our current commutes. We will still vote for it because it’s so important for the region, and one electric train to downtown is much more environmentally friendly than 3 articulated diesel buses, but none of us outside the junction is under the impression it’ll be any faster than our single-seat bus commutes. Bus lanes on a freeway, especially one through which general traffic merges, could NEVER host light rail trains. NEVER, NEVER, NEVER! I think Glenn’s idea is perfect, though. The four years of forced double transfers is simply not going to fly. Anyway,it’s probably moot. When Crosscut opens its pages to a “neutral” article about ST3 which accepts completely The Crimes cost figures without a peep of “WTF are you talking about?”, things are not looking good. If ST3 fails, there will be no new bridge to use for buses or light rail. If it passes, however, there is quite a bit of advantage, at relatively very little additional cost, to making the new bridge usable by buses and light rail. That is the push that I think Seattle voters need to push for if this passes. @Glenn — Are we still talking about West Seattle? If so, there is about a 1% chance of the bridge being designed for buses. Probably less. The new bridge will be adjacent (more or less) to the old bridge, which is designed for both cars and buses. The tunnel will be designed for rail. The elevated railway in West Seattle will be designed for rail. The railway above 15th/Elliot will be designed for rail. About the only thing that could, conceivably, be designed for buses (and bikes) is the new Ballard Bridge. But, when push comes to shove, I doubt it. Folks in West Seattle want a tunnel (understandably so) which means that if there is any extra money, it goes into that. The West Seattle tunnel, of course, will be designed for rail, and rail only. So, best case scenario, we add additional support where it is needed least (in Ballard). The one stretch that might have enough density to justify rail will have the opportunity to also support buses. Welcome to Seattle. We really don’t know what we are doing. Yes, I am talking about West Seattle. The primary idea here is to prevent West Seattle from having worse transit than it does now due to the double transfer that will otherwise happen during the period between the West Seattle line completion and the end of tunnel construction. After tunnel construction, then it becomes a light rail bridge, but buses could also use it to some advantage on routes not served by the light rail route. There could be a route over the bridge to the Mt. Baker transit center or some such. The West Seattle bridge can have buses, but those buses have congestion troubles in places. This is why West Seattle is asking for light rail. If someone were to do something about this particular issue, West Seattle would probably not be so adamantly demanding a light rail line in the first place. With the Tilikum Crossing here in Portland, the parallel Ross Island Bridge can have buses on it. In fact, there used to be some advantage to having the buses there rather than where they go now. Unfortunately, that bridge is now so crowded at peak periods that there is no point in having most of the buses go there. Route 19 is the last holdout for the convenience of people at each end of that bridge, and the busier and more crowded #9 and #17 take the light rail bridge instead. There is an elevated light rail section at the south end of downtown Portland too, but that is also designed to allow buses as well as light rail to use it. The buses can escape traffic there too. I certainly understand the tunnels would be terrible to do with buses as well as trains. Yet, the current plan is to plop the West Seattle trains into SoDo and have everyone transfer there. There is a busway right next to the light rail line there. Connecting the bridge to both the busway and the light rail line seems like it would be a pretty easy and relatively cheap item. It’s not like the entire tunnel network would have to be redesigned to make that connection. At the West Seattle end of things, the light rail line may be elevated but at some point they are going to have to have maintenance and emergency vehicle access to the line. The whole area is on a hill, so you are looking at what? Maybe 50 feet of extra ramp to get buses on and off the light rail bridge? Make that the maintenance and emergency access segment too and it isn’t as if it would be a wasted structure because it would be something that would be needed somewhere anyway. It’s probably not quite as cheap as the SoDo connection would be, but it still wouldn’t be enough to pay for a West Seattle light rail tunnel. A West Seattle tunnel would be even better. The line would have to go to ground somewhere anyway before entering the tunnel, and just make that the bus ramp too. That allows very easy transfers between the buses and the trains, which is what is going to have to happen in West Seattle. Having the trains and buses serve the same platform, but on different sides, gives everyone a very easy transfer. The West Seattle bridge could be so much better, but unfortunately there doesn’t seem to be much effort aimed at making the buses move better on it. That’s not a safe assumption; it assumes the bridge is designed to accommodate buses, that it has a roadway, and ramps to streets. I doubt ST is thinking anything of the kind, just as the downtown tunnel is not being designed to acommodate buses. I would feel better about ST3 if the transfer station details were better presented, and if there was a promise of a SeaTac/UW/Northgate overlay line. I also think that just having a needed high-capacity Ballard line go all the way to Tacoma would be a waste of effective service. The Ballard segment should have a second line east to Kirkland or Issaquah. I realize that the service plan will evolve in years to come, but noise needs to be made as soon as ST3 passes to design stations and tracks for these things. The inability to put a Y in the U District is a notable example of why we should have the badly, needed service plan discussion. 6-minute peak, 10-minute off-peak should be sufficient capacity for Ballard, which is a dead end. Its ridership will probably be similar to Capitol Hill Station. The northeast Seattle corridor needs double frequency because the U-District ridership (larger than Ballard) is on top of the Northgate/Lynnwood/Everett ridership. ST does not want a Y at the U district. It wants a crossing with a line that will continue East across L. Washington to Kirkland. ST is not highlighting this too much yet, but the study is specifically for a line from Ballard to UW and a second L. Washington crossing. U District will be the interchange, but it will not be a Y it will be a crossing. Problem with this article, is you’re appealing to me with benefits I won’t reap for another twenty years. Will I be alive then? Will I live in North Seattle, let alone, in Washington state or USA? Will traffic even be a problem in 2040? With all the self driving cars and share-economy? Do I care that green line will carry more than Portland Max system? No this is not about competition, I bet any of NYC all day subway routes carries more. Graham st station? To make ride to airport even longer? Again does not appeal to me. Seattle prop 1, as much as I hate paying taxes, at least gave me something tangible, something I use — this only gives a bill, according to the calcutor on st3 site, close to $900 of taxes and nothing I’ll use in the next 20 years. The whole plan is building stuff sequentially and that’s it’s major drawback. Look at Denver, that’s often scorned at in this blog, they are building several light and heavy rail lines in parallel. One gets delayed – others get speed boost from additional workforce. You really should use the NoST3.org calculator as it includes the taxes you’re already paying with ST1 & ST2. It also calculates the ST3 Tax per household not per individual in the household. Well I already do pay those and I use the benefits that this tax is paying for, so I’m fine with those. While I am sure, I’ll be dead in 20 years, and there’s no _real_ benefit for NW Seattle in the near future at all from ST3. Then vote no and we can be 40 years later. Also, I’d like to hear your thoughts on how self-driving vehicles will actually solve traffic problems. The sharing economy might reduce car ownership, but its effect in increasing travel capacity is zero. 1. That’s not correct, you do reap indirect benefits from education taxes. You benefit from educated children around you — less crime, better job prospects, etc. 2. Self driving car is more efficient on the reoad, it doesn’t text on the phone, it can accelerate faster on a traffic light (this is the best depiction that I’ve seen: https://www.youtube.com/watch?v=iHzzSao6ypE). Also with bigger advance of electric cars this is even a bigger issue, since electric cars accelerate much faster than your average civic. Plus with self-driving+sharing economy owning one becomes a serious nuisance. Now the main points of my original comment is: first _this_ article fails to appeal to me as a voter. Second, while I object partially on ST3 (seriously, 30m Sounder runs and collector/distributor bus networks around Sounder stations imo is a better solution than light rail to Tacoma — though, yes, I understand WSDOT/ST do not own the tracks, but I there is always a solution) I don’t really oppose neither the price tag, nor the scale — I oppose how the plan is laid out and how it’s mostly sequential. Whew. Strange that transit and education have similar benefits. Transit provides better job prospects because of increased number of job markets that can be reliability accessed without owning a car. Also, transit increases access to higher education… just look at UW, North Seattle College, Highline College, etc. People can suddenly access education because they have a fast, reliable way to get to their training and classes. Sorry that this article and Prop 1 fail to appeal to you because you don’t see benefit for yourself. I think it’s great to improve a place for future generations. The argument for self driving vehicles goes something like this: Ten years from now, self driving trucks are commonplace, and transit agencies are investing in similar vehicles. The trucks also have remote control backup, and this makes even more sense for buses. Not only do they get a vehicle out of a jam (when the computer encounters something that it has trouble understanding) but it helps with fare enforcement. Like the trucking industry, this scales really well. Investing in a huge fleet of smaller vehicles starts to look appealing. But investing in all of these vehicles and the remote control system requires a fair amount of capital. If you want to run buses or vans everywhere at five minute headways, it will take a lot of vehicles. It may pay off in the long run, but there is a very large initial cost. Instead of focusing on only a handful of secondary rail corridors, we should invest in that instead. In the meantime, we still have ST2, which covers by far the most important corridors as well as the improvements made by SDOT. So instead of spending billions on lines that won’t work that well for that many people, we invest in technology and vehicles that are a better match for our density. I’m not saying all of this is inevitable, but it wouldn’t surprise if it came to pass. Running driverless vans that can hold maybe a dozen people every five minutes, in mixed I-5 traffic, is certainly no substitute for running trains every five minutes that can hold 800 people, and flies over what already are and will still be congested freeways. That congestion is real now, even if you believe it isn’t. An extremely optimistic, spatially-challenged Autopia vision of the future that ignores the law of induced demand is the goofiest argument against ST3 I have heard. But, yes, transit agencies should be investing in driverless technology, and doing so faster, especially for trains carrying hundreds of passengers. ATC should have already been installed, but the agencies nationwide keep pushing it back. Excuse time is running out as lives are lost. Do you have kids in Seattle? Do you want them to be able to live here, and get around their city without sitting in hours of gridlock? If not, then sure, vote against paying a few extra hundred dollars a year, couldn’t blame you. But if you have loved ones that are younger than you, perhaps you could take the opportunity to consider their interests as well. Said above. Nope, I don’t and don’t plan. But seriously, if I would, I sure won’t live in Seattle — with all the human waste (in all senses of the word), trash and used needles, much weaker schools than, say, LWSD or BSD, why would I even remotely consider raising my kids in Seattle? >> Do you have kids in Seattle? Do you want them to be able to live here, and get around their city without sitting in hours of gridlock? Oh please, give me a break. I have kids and this will do nothing for them. They happen to live in one of those obscure areas that isn’t directly or indirectly served by ST3 (Fremont — perhaps you’ve heard of it?). They, like most of the city, will spend their time riding buses. When all of this is done, we will have spent billions on a system used only be a handful, because someone thought Ash Way is remarkably similar to Capitol Hill. It is really absurd. No one builds systems like this, and those that do (e. g. Dallas) have ridiculously low transit ridership. Meanwhile, maybe we do want to spend money on education, health care, mental health services, day care or the police. For most of the city, spending money on that will have a bigger impact on their lives than this assortment of rail plans. Fremont at least might benefit from the SLU station, so that you can transfer there rather than stay on slow surface routes. There is also the potential of Fremont benefitting from redeployed service hours. @Glenn — Right. Slow surface routes. Except that by the time rail gets to Ballard, those slow surface routes will actually be reasonably fast. Of course transferring to the two (count them two) stops will be faster. If you want to get to 1st and Mercer, or Westlake and Denny (both good stops) then it would be faster. Take the bus onto Aurora, get off the bus, go into a tunnel, and take the train (one stop). But by then Bertha will be done digging, which means that one of the cross streets (e. g. Thomas) will likely be a transit only street. This means that getting to Taylor and Thomas, Westlake and Thomas or Fairview and Thomas will be just as fast. Since Westlake and Thomas is essentially adjacent to Westlake and Denny, the only real improvement is to 1st and Mercer. How much of a time savings? Two minutes, maybe (if that). The number of people in Fremont that will benefit from this is tiny, and those that do will see a tiny improvement. Compare this to ST2. ST2 will enable a dramatic change to Fremont. It is nowhere near it (of course). In fact it is farther away from Northgate Link than it is from Ballard Link. But Northgate Link and Lynnwood Link will have a much bigger impact on Fremont. Northgate or Roosevelt to Fremont will be much faster. Lake City, Bothell or Lynnwood to Fremont will be as well. In fact just about everywhere in Snohomish County to Fremont will be faster. Get over to Link, go the U-District and then take a bus to Fremont. I wonder if they will be able to find the service hours to improve that bus? Of course they will, because it isn’t just a matter of reshuffling the deck, it is matter of demand. Suddenly a huge portion of the city will be attracted to the 31/32, because it will be by far the fastest way to get to Fremont (and Ballard). Metro will run that bus more often because it is in high demand (fare box recovery will be high). That is profoundly different than adding service within West Seattle. In West Seattle the train won’t be faster for most riders, which means that it doesn’t increase the demand to the stations. It is bizarre to me that folks suggest that we should spend billions so that we can then add some service somewhere that costs millions. If you want to add service, just add it. ST2 will, of course, save some service hours. But it is nowhere near the greatest value added. Just looking at place that is a very long way away from it (Fremont) shows that. Oh, and doesn’t it strike you as odd that the later addition has less of a network effect than the earlier one? But the No campaign at least pretends to care about bus investments, so acknowledge the bus investments in the article. They take just a couple years to kick in. And if you don’t think bus investments matter, then there seems to be multiple No campaigns not liking each others’ alternatives to Regional Proposition 1. There’s also the transfer to public education that kicks in immediately. Some newfound friends of public education have been harping on the need to spend this money on public education, without acknowledging that it isn’t competing for tax capacity and *is* helping fund education. Sound Transit doesn’t just run trains. It runs a network of express and BRT-lite bus routes that have been getting very good ridership, in spite of sitting in traffic, and getting no help from the temporary fans of BRT to get out of that traffic. Some of the temporary fans of BRT are even jumping on the RapidRide bandwagon, with no evidence they had anything to do with it other than not vote to fund it. Your answer is for something else. This article is why _Seattle_ should vote for ST3. In Seattle ST basically runs light rail trains. Sounder and the express buses you mentioned only terminate in Seattle and go to Pierce county. So, for myself, as a person living in North Seattle — ST3 is a failed proposition. If I lived in mid-Snohomish county (south is already covered by ST2)? South KC? — it might have been a completely different conversation. And well, Madison BRT is more of a KCM’s domain (or RR D/C/E, for that matter), so no, I don’t really see bus improvements either. -The majority of the local funding for Madison BRT is from ST3. -The projects can (and are likely to) be delivered faster than advertised. V., the No campaign is blanket denouncing rail in favor of BRT they’ve never lifted a finger to help make happen. I would think that leaving the city better than you found it would be a good enough justification, but I guess to each their own. If we applied that reasoning to every large infrastructure project, we’d never build anything, and our children would curse us. Maybe you will. What then? It’s an open question whether self-driving cars will really live up to their hype (more than 20% market share), and if so, whether traffic will get better or worse. It depends on how people’s behavior changes. Will they make the same number of trips as now and send it home if they won’t need it for more than an hour? Will the closer highway spacing really materialize? Will the closer spacing be realistic on city streets with cars and pedestrians entering and exiting every block? Will people tell the car to hover around for an hour so they don’t have to pay for parking? Will they send it out for pad thai and a quart of milk more often than they drive now? Transit wonks do, and this is a transit blog. Raising Westlake-UW travel time from 39 minutes to 39.5 minutes. That will be dwarfed by the probable 5-minute decrease when buses are kicked out of the tunnel. As for whether it benefits you, we can’t tell that without knowing where in north Seattle you live, how close to a station, and where you commonly travel to. I have lived in the U-District, Ballard, and currently Capitol Hill, and travel within Seattle for work and to Bellevue to visit relatives. My roommate travels to Kent and Everett for work and takes classes at Bellevue College. So we will use ST2 and ST3 Link heavily. I’ll also be glad for the opportunity to go to West Seattle, Ballard, Tacoma, and Federal Way by train on the occasions I do so, and to Kent via Link+RapidRide. And in twenty years I may work elsewhere, at some location unknown now, and I’ll be glad for an extensive transit network to get me there, without having to deal with unreliable buses on freeway bottlenecks and traffic lights. — order that stuff is being built. Seriously, the article boasts 144K people every day from Ballard and for whatever reason that’s one the last pieces to build. — that the things are built serially, rather than in parallel (also completely ignored by everyone my quote about Denver ;-)). As for your other comment about uber and its amigos — I presumed more in the tune of Car2Go and its friends. 2-3 mile trip on car2go, depending on the traffic might be cheaper than transit (2.75 presumed, and it won’t stay long until it’s $3, I’m sure, but that’s speculation). Sorry, I meant to address the serial project issue. That’s due to the state’s tax constraints. The state set a tax ceiling and specific sources, so ST has to space out the work over 25 years rather than doing everything at once. And it can’t start 2/3 of the work until 2023 when ST2 is finished and the ST1 bonds are partly paid down. Voting no on ST3 is unlikely to improve the situation: it won’t make the state suddenly willing to raise the tax ceiling. And note that this results in a suboptimal system, because those lines aren’t necessarily near where people live or work: Link is almost a decade newer but already surpassed Denver in boardings per mile even before University Link opened. I’m saying that building a bunch of lines at once is easier when you have empty right of ways already graded for you by long ago engineers. The additional cost is generated by additional complexity that requires more resources and bandwidth to deal with. ST is building three lines through complex geography at once, I’m not sure that you can really improve on that. Even if you could, the funding issue is real. Bonds exist for a reason, but in this state you go any higher on the bonding and you’ll need a 60% supermajority to pass the measure, which killed forward thrust’s subway. There are plenty of graded row’s around the Puget Sound. They are now all bicycle/walking paths. Not in the right places. There’s nothing from Seattle to Bellevue, or from downtown to the U-District. There is one from Fremont to Husky Stadium to Kenmore but it completely misses the largest population center around 45th to 65th. Portland had a right of way straight out to Gresham where it wanted it, Mark D said Vancouver’s Expo line went on a railroad right of way, and I gather BART’s Fremont line was also in a railroad right of way. Too bad there’s no such thing from downtown to West Seattle. And where’s the right of way from downtown to Everett? Along the edge of the coast, the furthest possible away from the population center of Lynnwood. And Federal Way, sorry no railroad. But in that case it’s partly south King County’s fault; it should have put Federal Way’s population in Auburn or Kent. But in any case, other cities have legacy right of way straight between their population centers. Seattle and Pugetopolis don’t much. Not only does it not remain, in many cases it never existed in the first place. Only because we decided, and still do decide to create new towns and cities around pavement. Kenmore, Shoreline, Mill Creek, Lynnwood are four that were mere strip malls around a major intersections. They had to ‘invent’ a town center. I can’t wait to see what springs up around the I-405 BRT freeway stations. I didn’t address driverless taxis. Taxis and Uber currently cost around $10 for a 2-3 mile trip. Transit costs $2.75, and with a monthly pass it comes down to $1 or less if you ride frequently or have low-income ORCA Lift. Even if driverless taxis lose the expense of the driver, do you really believe the for-profit companies will pass the savings on to you? If so, I’ve got a bridge to sell you. They would have to reduce prices by 2/3 to equal transit, and it gets worse if you’re going longer distances like 10+ miles. Cost of vehicle ownership is generally approximated at 50 cents per mile. So, this would be the minimum price that Uber would have to charge without drivers. They also have to pay administrative costs, software development, server operations, etc. Meanwhile, if Uber goes driverless, buses will too, and fares would likely drop. You left out liability costs. Today, Uber puts much of that cost on their “contractors”. With driverless vehicles, Uber would bear full responsibility of any accidents. The transportation market has, and will continue to have a lot of competition, which will deter price gouging. The presence of Lyft has made Uber a lot cheaper than years past, and the presence of ReachNow has made Car2Go cheaper than it was just a few months ago. Unless you have government regulation that limits driverless taxis to a single company, nobody will be able to charge $2.75/mile without being severely undercut by the competition. 1. What improvements have actually been announced for the RapidRide C/D? Short of 24/7 bus lanes on 15th (which should be done tomorrow) and adding more service, the only improvements I could see are either eliminating the LQA divergence or turning the 15X into an all day RapidRide D ‘limited’. 2. What is the purpose of the Graham Street infill station, short of more stations=better? Rainier Valley already has decent station spacing (~1.5 miles). Why plunk a station at Graham versus any other in-between locations in RV? Wouldn’t the money be better spent on boosting bus frequency along the RV route so that everybody along the RV route has better access to Link? The other infill, 130th, is a whole different animal and makes a little more sense as an east-west bus transfer station. Graham doesn’t really fill that role, it just seems to eliminate a quick bus transfer for a small area around the intersection. Graham St is one of the longest continuous east-west streets in Rainier Valley. It doesn’t have a bus line at this time, in part because there is no Graham St Station to connect to, but it has a lot of potential ridership. The station isn’t just about its own walkshed (which is a major business district oriented toward various Asian immigrant communities), but also about supporting a more sensible bus network with less milk-runny routes that can serve a wide swath of Rainier Valley that has heretofore been left out of Metro’s bus network. It was partially a victim of the recession that led to the Rainier Valley line being scaled back. It’s really hard to say whether Graham or 130th will get better ridership. But I certainly do hope ST finds a way to get 130th open at the same time as the rest of Lynnwood Link. BTW, If you want 130th St Station to happen, Regional Proposition 1 is likely your only chance to get it. Good explanation. I’m not against the Graham Station, I just never understood how it became one of the largest transit rallying cries. I have no skin in the 130th Station game, but am a lot more familiar with the surrounding area, so could understand the need for it. 1.5 miles is terrible stop spacing for an urban area. People who live next to the train and have it whiz by their homes shouldn’t have to wait for a bus to take them three-quarters of a mile to the train station when there should already be one in easy walking distance. Columbia City to Othello is the second-longest gap in ST1 Link. Only Rainier Beach to TIB is longer, and that’s industrial/highway land. Both sides of Capitol Hill may be longer, which has been lamented here, but that has the excuse of hills and the Ship Canal and low-density houses breaking up the urban village, while Rainier Valley is continuous. I timed the walk from Graham Street once, it was years ago but I think it was around ten minutes to Othello Station and twenty minutes to Columbia City Station. That plus the surrounding housing, theoretical upzone, and east-west bus route make it a worthwhile idea. And the travel-time overhead per station is only thirty seconds. Metro’s long-range plan has a Frequent route on Graham from Rainier Ave to Lucile Street, Georgetown, East Marginal Way, South Park, White Center, and Westwood Village. Nothing specific. Just vaguely street improvements. Wait, White Center, north Ballard and Sand Point crossing are provisional projects? I thought they were just studies? Did Seattle Subway screw up or am I just confused? They are just studies. Check the map key again. Everything in grey can be built as part of ST3 if Sound Transit gets additional funding (fed/bonds/state/coming in under budget) without raising taxes. Seattle Subway covered that in an earlier article. Which according to Martin’s post the other day, the ST lawyers are saying that it can’t be done. We had the same source as Martin. The caveat has always been that is has to be additional funding (as TR points out) and that it has to be a LRP/Study line. It’s possible that they were misleading us, of course, but that was not my impression. I read Martin’s comments on the podcast as involving some translation from him about the will to make the projects happen. And just to avoid confusion, the point of the studies is not to have fallback options if RP1 goes down, as in Vote No and we can then vote to fund a Crown Hill-Ballard-UW-Kirkland line and a West Seattle – Burien line that don’t connect with the rest of the network and have their own train bases. The point is to plan for more lines in ST4 someday. That vote would come much sooner than 2040, as ST tries to keep a steady pipeline of projects, and not just finish everything, shut down construction work, and then come back to the voters. If you want Ballard-UW, vote to get the train line connection from the SODO facility to Ballard, so that Ballard-UW can become possible, and then start lobbying for ST4 to happen around the time ST2’s project list is done and open for service. There’s conflicting information on whether Ballard-UW can be built with ST3 excess funds. Seattle Subway says yes, Martin talking with ST’s lawyers says no. The Burien extension probably has more of a chance because it’s a well-known extension rather than a new line. As for the Sand Point-Kirkland lake crossing, that’s so unlikely I wouldn’t take it seriously this round. A lake crossing would be extremely expensive for mediocre ridership, and a downtown Kirkland that doesn’t want to hear the word upzone. We have the same source as Martin, our understanding is that addition funds can be used to build things in the LRP as long as the tax rate isnt changed. I would imagine that extra funds in the north king subarea would be used to extend Ballard Link up to 85th and West Seattle Link down to Burien rather than building Ballard-UW as an entirely new line. ST will probably always feel more comfortable with extensions than new lines. University Link was built with excess funds (that is, it was cut from the ST1 package in its funding crisis and funded separately by the feds). So, I consider excess funds likely. the downtown to Ballard line will turn east and head to UW — this is the reason for Ballard to UW not coming now — the Interbay line connects the UW -Ballard to the rest of the system. You are likely right, however that if they can bring rail to Burien TC OR bring rail to UW from Ballard, Burien will likely win because it’s a regional TC, even though N King would likely prefer the Ballard – U District to come first. ST has not said that as far as I know. The Ballard line can end pointing east for an extension to the U-District and the Eastside. Or it can end pointing north for an extension to 65th, 85th, and possibly Northgate, Lake City, and Bothell. Or it can have a Y and do both, since there will be plenty of capacity in the second downtown tunnel. I believe ST’s earlier studies were ambiguous whether it would end at Market Street, 65th, or 85th — it depended on how much money was available. I don’t think ST would be willing to turn east and preclude the possibility of an 85th extension, because I think ST sees 85th as an extension and Ballard-UW as a separate project. 1). Federal funding. ST is only budgeting for 11% from the feds. We think they will do better than that and we think additional transit investments at the federal level are very likely in the next 10 years. 2). Bond cover rule change can create a lot of capacity. ST3 does NOTHING for anyone in Seattle who lives between 18th Avenue to the west, Lake Washington to the east, Jackson Street to the south, and the Montlake area to the north. That is an awful lot of people to forsake when claiming how much “the people” of Seattle will get out of this. Until Sound Transit proposes a line from Mount Baker (or Judkins Park) to Capitol Hill (or UW) that stops at 23rd & Union or MLK & Union and 23rd & Madison, I will not support expansion. And I don’t think that I am alone. You must be talking about Metro route 8. That’s a very specific plan. The only thing your proposal(s) adds is joining those other trip pairings that will already be connected by light rail to some point along MLK or 23rd near Madison or Union. I don’t buy the idea that if I have a particular subway route I want, and I don’t get it, that the whole rest of the transit network is useless for me. There is a reason it is called transit and a network. By your logic, the Route 8 Subway does nothing for anyone who doesn’t live within a few blocks of 23rd/MLK and Madison/Union. So, why should I vote for the Route 8 Subway? What? You don’t know what you are talking about. And if you work for ST, we are doomed. I live in Madrona – and not close to the stations I proposed. My comment has nothing to do with serving people within walking distance of 23rd or MLK and Union or Madison. The Metro 2 and 3 lines are the only useful pieces of the transit network for a Madrona resident. Neither line goes anywhere near a Link station in an amount of time that could ever prompt someone to think about taking a bus to then use Link. So, Link is useless for a lot of residents of Madrona as part of the overall transit network. And this is true for the entire area I described. But, I would take the Metro 2 to 23rd and Union (<= 10 minute ride), or MLK and Union in order to use Link and it would provide an incredible amount of value for me. I could then get downtown in 20 minutes or so, I could get to UW in 15-20 minutes, and I could get to the airport in less time than my current alternative (Uber to Mt. Baker station and then Link to SeaTac). The CD and Madrona are within a mile or two of Westlake Station, Capitol Hill Station, and via Madison BRT University Street Station. Greater Ballard and West Seattle are further than that from Link, except for the part closest to U-District Station. First, distance does not consider geography, nor correlate with time. I have demonstrated why people in the area I described will not use any of the stations you mentioned. Defeat that argument. Second, the population density of the area I described around my proposed stations would result in much higher usage than in West Seattle. Third, these stations contribute a lot to network effects – unlike West Seattle in particular. But most importantly, why should a resident in the area I described care anything about Ballard or west Seattle, if he/she will never find it practical touse the system to go to those places? You’ve demonstrated why you won’t use it. East Seattle has diverse people, some of whom will be inclined to take it. West of 18th is denser than east of 18th. Madrona is a very specific place in the less-dense part. Part of the 2’s walkshed can also use Madison BRT, in fact the denser part. The speed of the 2S, 3S, and 4S is abominable even compared to other trolley routes, so I feel for you there. If Metro moves the 2 to Madison where it can share the BRT lane, it would get much faster. Oppose the “Save Route 2” folks who prevented it from happening in 2012 and 2014. Of course Metro would have to get left-door buses for the 2 to share the transit lane, but that’s not insurmountable and will affect more routes as the RapidRide+ network expands. There are always people who won’t support a transit expansion measure if it doesn’t benefit their trips. If they don’t accept the general benefits to the community that have already been articulated, and the fact that they’ll occasionally use it if they travel all around town, then I have no arguments to add. Except that I don’t know were I’ll live or work in ten or twenty years, and maybe you don’t either, or things may turn out differently than you expect. It would be sad to vote no on a transit expansion measure and then find yourself living in an area that would have benefited from it. It would be like the people who voted no on Forward Thrust, and they and their children didn’t have rail for thirty-five years. There have been neighborhoods that were at the bottom of my priority list that I never thought I’d live in, but then things change and I end up living in them, and they turn out better than my earlier opinion predicted. In any case, the west half of the city has a strong geographical case for the next line. That would allow people to get to all quarters of the city, and then they can take a short bus ride from there if necessary. I sympathize with the density argument in the CD and Denny Way area, but that’s not a 100% overwhelming argument that you’re making it out to be, and most of the city’s residents have not accepted it at this point. ST3 is going to add a transfer between SE Seattle/SeaTac and Capitol Hill/UW/Northgate – and ST2 makes those connections directly. It makes life for anyone East of I-5 less attractive unless they are going to SLU or Ballard or West Seattle. Because nobody in the CD has jobs in Tacoma, Federal Way, Everett, Ballard, West Seattle, Kirkland, Issaquah, Redmond, or any reason to go there, nor do they want customers from those places. Um, sure. Better idea, Kevin. Let ST-3 budget either include, or take the financial load off of the reserved-lane, signal pre-empting express trolleybus line that corridor is also going to need eventually? Because especially if you get your wish, even more after completion than before, that corridor is going to need efficient surface transit between stations. From the last 20 years’ personal experience self-employed after leaving off trolley driving, economic trend extending beyond ST-3 project life will make this whole region a subarea of a larger one, whatever the boundaries. Ballard used to be its own separate commercial fishing and light industry port town. Wish I could live to see it turn back into that, but would settle for conversion of boutiques and hair salons that look equally machine-oriented, but smell less like salmon and snoose. Though nobody can predict fashions in fragrance. Couldn’t the same argument been made for Ballard for ST2? Ballard didn’t get any direct benefit, but we’ll still see easier trips to the Eastside and to Snohomish County by transferring downtown or in the U District when it’s done. Same applies to the Central District and Madison Park, etc: easy connections to the full light rail network at UW, Judkins Park, and downtown stations via frequent service on the 48 (soon-to-be RapidRide) and the Madison St BRT. Or if you’re in Madrona, you can use the 2, 3, 8, or walk to 23rd or walk to Madison. Sooo many options to connect to light rail. Also Ballard strongly supported ST2, even with the lack of direct service from light rail. Nobody who does a cost/benefit analysis incorporating the value of one’s time would take a bus to another bus to a Link station, followed by a train ride to another Link station before walking to one’s final destination. If that is what you are trying to sell, do you wonder why so many people continue to drive? I mean, really. Kevin22. It’s easy. I didn’t list five different bus routes because you’d have to transfer 5 times… I’m just showing that there are plenty of frequent routes that would directly connect to multiple stations. Central Seattle has the best links to the ST2 and ST3 light rail network. Never more than 1 short bus ride to or from all the light rail rail lines. 1 transfer, so simple. Not true. Have to take the 2 to the 48 to Capitol Hill Link station, and then to whatever Link station destination I want to go to. That may be simple, but it is not short, nor particularly cheap, and it is fraught with potential bad outcomes. Again, why would I not just drive? Your whole argument is based on the premise that somehow it would be unethical for me to do what is most efficient instead of what is most politically correct. If you’re not using ORCA, it wouldn’t be. Please explain what you are talking with the 48. The 48 does not go to Capitol Hill Station. I’ve walked from Capitol Hill Station to Madrona several times. It’s a 20-35 walk, depending on one’s walking speed and what part of Madrona you’re talking about. Yes, it’s hilly – the whole point the walk is to get your workout in going up and down the hills. It is much more time-efficient to get your daily exercise walking to the train and to drive all the way and have to spend half an hour on a treadmill later. Glenn, I think Portland’s Tillikum Bridge is a very good example of the way ST-3 as a whole should be handled: Built the project in stages, with each stage carrying passengers from the beginning, with every segment designed for transition to the next stage without interfering with service. Since I think West Seattle needs a subway, it will be better for transit to have its own bridge. Which given the grade between the east bank of the Duwamish and the bluff over the west, has good reason not to be movable. This bridge could also be designed for joint rail-bus ops. Gut-level, for reliability, Ballard would do better with a tunnel than a bridge. But no argument about it. If memory serves, Chicago ‘El has had a drawbridge on its main line for about a century. MAX between Chinatown and Lloyd Center is ok too. Like the idea of bikes and pedestrians on the bridge too. V. ag., tempting to say that your thinking is proof that your forebears should have adopted it. Though I agree with you that ST-3 needs to be staged out to so nobody has to ride colored lines and dots for thirty years ’til their first train. Though transit’s 26 year attitude to DSTT operations proves the savage political diligence needed to assure that tomorrow’s fast trains aren’t excuses for today’s tubular underground dual-mode parking lot. Same time period proves that starvation has same effects on both public functions and draft horses. Also, tight budgets don’t motivate greater and smarter effort, but give the survival-skilled lazy their dream excuse for inaction. Compromise on Graham Street LINK station: We build it as part of the same project taking express trains past Boeing Field to Sea-Tac Airport, as any city of the size we’ll be then has done long before now. Which will also include undercutting cross traffic at every MLK station. Meantime, since if average American eats and worries less, the only sane response to living in the richest, safest, and most irrationally scared country in the world, odds show that you won’t even need a kneeling bus in twenty years. Meaning no excuse for avoiding the political involvement that will get you everything you want about transit and everything else an active voter can control. The Ballard segment is estimated to generate 144,000 riders, more than all of MAX. It is also more than double the current 20-mile Central Link line average ridership, and it is 43% higher than Link’s highest ridership day (101,000 boardings), which pushed the limits of Link’s current infrastructure and number of light rail cars. I have to wonder then, if Ballard is 144,000 daily boardings, why is this only now happening? If that line would generate such an enormous number of riders, shouldn’t that have been the first Link project being built? Why didn’t Sound Move just fund Ballard-downtown, UW-downtown, downtown-RV, and leave the airport for later? Or it could have also just been Ballard-downtown-RV-airport, and left UW for later. Probably because in 1998 Ballard and SLU were not nearly the destinations they are now. The 20 year growth projections for Ballard were beat in a few years due to the recent developments. Back then, ST was trying not to compete with the monorail. The proposal from the planning professionals eventually got built, with some changes. The proposal that wasn’t developed by planning professionals (the monorail) didn’t get built because its funding and cost estimates missed by a few miles, and because its attempt to force the City of Seattle to build it was a highly dysfunctional approach. Those thinking they can force ST to build their personal favorite projects by shooting down ST3 should review the history of the monorail. Not all of them are going just from Westlake to Ballard. A lot of them are coming because this alignment goes to SLU. SLU’s rapid job increase went far beyond most people’s projections even as late as 2005, and probably beyond even Vulcan’s projections. So people will come from the entire region to SLU, both from the south end or via a train-to-train transfer. Then there are the people who will come from the south end to Ballard because it’s a one-seat ride, who wouldn’t be as enthusiastic otherwise. Then there’s the need for a second tunnel’s capacity downtown for intra-downtown and other trips. All that is what leads to the 144,000 boarding figure. Which, by the way, I suspect is a high estimate. 70% of the average daily projected ridership of just the Ballard to Downtown section (9 stations, 6 excluding downtown)? Granted, I assume this is 2040 population they are talking about, but still. That’s 22% of the current population of Seattle. Some of those 144,000 riders are coming off of buses or trains (SeaTac and Rainier Valley riders are moved to that new tunnel if they want direct service) that currently run in the existing DSTT or on Third Avenue (as bus routes get eliminated once the system is built). Some of the other riders are coming and going to the high-rise buildings being erected on the corridor that are not yet occupied (noting that these buildings were never asked to kick in a larger share yet they get this huge windfall of better access, especially in South Lake Union — and will probably consider suing for mitigation money that they think they deserve because of the disruptive subway construction). This November, voters in King, Snohomish and Pierce counties will be asked to vote on Sound Transit Proposition 1, referred to as ST3. Details of this proposition are at http://soundtransit3.org/. ST3 would add 62 miles of light rail with stations serving 37 new areas, while growing the system to 116 miles between Tacoma, Seattle, Everett and the Eastside. ST3 is a 25-year project that will cost $54 billion, and it will be paid for by increases in property taxes, car tabs and the sales tax for residents of the three counties. I oppose ST3, given what the plan includes and the cost of the proposal. Regarding the former, it appears that the plan will not solve the traffic problems in the three-county area. Regarding the latter, the cost is excessive. In the past, voters in Seattle have made several commitments to transit by increasing our sales tax by 0.1 percent and by funding Move Seattle, which increased our property taxes to make major improvements such as the addition of a Madison Bus Rapid Transit route. We will also continue to pay for Sound Transit’s ST2 construction with a 0.9 percent portion of our sales tax. ST3 would bring annual Sound Transit taxes on the average household to around $740 and commit perhaps $20,000 of their residents’ household money over the next 25 years to Sound Transit. Unlike ST1 and ST2, this measure creates a new property tax and permanent taxing authority for Sound Transit. ST3 would increase property taxes by 25 cents per $1,000 of assessed value for years. ST3 would increase Sales Tax by 0.5 percent (from 0.9 percent to 1.4 percent) for years. The new sales tax would be 10.4 percent in Seattle. ST3 would increase car tab fees by 8 percent for each vehicle owned for years. Renters will likely face rent increases since apartment owners will have to pass on the property tax increase. Based on recent news, there are some real Sound Transit credibility issues. Can voters trust Sound Transit to be prudent and make the right decisions, once it receives a blank check? Elections were a way to hold Sound Transit accountable during its first and second phases, which will take years to complete. If ST3 is approved, then Sound Transit wouldn’t have to ask voters for more support for decades. Other concerns include locking the region into a $54 billion spending plan that would take decades to complete. This funding is in addition to the school funding decree from the Washington State Supreme Court. The money for school funding and this money will most likely have to come from property taxes. A property tax exemption available to senior citizen households with a gross income not exceeding $40,000 with the only allowable deduction being for medical co-pays. Can one live in Seattle with an income of $40,000 a year? The amount may be adequate in other parts of Washington state, but not in Seattle. This income test is a problem that our Legislature needs to work on to prevent seniors from losing their homes. A property tax deferral available to senior citizen households with gross income no greater than $45,000 per year. At 5 percent interest paid when the house is sold, the program is effectively a lien on your property taxes. A lien means that homeowner would be unable to get a home loan since the lien would have to be paid off first. A lien is paid by the proceeds of the property when it is sold. Seattle has three agencies working the transit needs of its residents: King County Metro, the Seattle Department of Transportation and Sound Transit. I was amazed to find that there is funding for the Madison Bus Rapid Transit in ST3, despite no mention of that when we voted on Move Seattle. I would love to be able to support ST3 but, as a senior Seattle resident homeowner, I can’t commit $54 billion to a light rail expansion and other improvements that I may not even live to enjoy! Yes, the Broadway and Husky light rail stations have been a success, but we won’t get light rail to Northgate until around 2021. We need a way to plan and fund our transportation needs for an ever growing area. ST3 does not provide solutions for mass transit as well as for vehicular traffic. We need to have transparency and cooperation between the three transit agencies in Seattle and they need to start working together to solve problems rather than create them. A good example of this is the location of light rail on Broadway which would have been much better at Broadway between Pike and Pine rather than at John. This Broadway Light Rail location caused numerous problems with the March 2016 Metro restructure. A 25-year commitment for $54 billion is an excessive commitment for Seattle residents since they have already taxed themselves for Move Seattle and the maintenance of existing Metro bus service. One must ask, why can’t other jurisdictions in the three-county area covered by Sound Transit do their own version of “Move?” Why shouldn’t Sound Transit’s users pay more for the use of light rail? Why is it okay to ask people using the 520 bridge (and the 99 Tunnel) to pay tolls and not ask for light rail users to pay for added service? Why can’t businesses help pay for light rail expansion? This sounds like an old man writing about how selfish he is. Do you not wish that others, who will come after you, can move about the city and greater tri-county area, and thank you for the support you provided so many years ago to make this transit infrastructure (and the property values it supports) a reality? ST3 isn’t for you, or me. It’s for the next generations. Calling me an “angry old man” doesn’t help you get people to vote for ST3. Just read the other comments on the STB, and you will see you don’t have to be an angry or old to be voting NO and we are NOT SELFISH either! Did you know that transit riders pay a fare? But we don’t pay for the full cost of the system. Neither of course do the users of 520 since they all got to the bridge on free streets, but ignoring that, I agree that commuter riders should pay more. The peak hour surcharge should be double the base fare. The people who ride in the middle of the day are either “choice” car-less riders most of whom are “creatives” or poor people who couldn’t get around without the bus. I don’t think anybody minds subsidizing the poor folks — at least I hope nobody does — and t car-less people do benefit everyone else by freeing road and parking space for others. So giving them a subsidy seems relatively reasonable. But at the peak hours people are getting a hell of a deal! with transit. Riders then should pay a greater portion of the operating cost out of the farebox. Here in Clark County C-Tran runs expresses to downtown Portland and Marquam Hill during peak hours with a $3.90 fare each way. The express system covers 64% of its operating costs. KC Metro already has a peak surcharge, but it’s pifflingly sill. It should be significantly raised. For SR 99, tolls will cover around $200 million of the over $3 billion total cost. It’s the idea that we all pay for something that benefits the greater good. Though users who benefit more can pay more… such as fares, tolls. Cleveland Shaker Heights streetcar line was far from the only one built by real estate developers to boost their sales. Still think we should go them one better by getting ST developer status, and doing the same things with new developments containing homes, schools, and places to work? Complaining about the cost overruns in ST1 when you have the trouble free example of ST2 to look at strikes me as pretty misleading. If the proposal was to stand up an entirely new agency for ST3 and hire Bob White and Paul Bay to run it I’d agree it was relevant (not to crap on those guys too much, they were handed an impossible task by the politicians). But it hasn’t been amateur hour at ST for more than a decade and to ignore that is disingenuous. Of mistakes in ST1? Mainly massively underestimating the cost of tunneling, making promises about a Portage Bay tunnel before investigating its terrible geology, and failing to anticipate the UW being an immovable object with respect to running trains under campus labs. ST2 was much more conservatively developed with the benefit of experience and it shows. Revenue losses due to the recession resulting in the South King Link shortfall and the nonsense with Bellevue have really been the only hiccups in what is, by North American standards, an insanely ambitious expansion program. What about a streetcar line down Madison to the lake, and fast ferry boats to every port from Bothell to Renton and in between? I forget. Did Madison have a cable car line too? I think a measure like this would be both beneficial and popular for every neighborhood on the line. Why can’t the system pay for itself? I don’t mean “pay for its own up-front costs”, I mean sustaining. We’re debating spending $54B on a transit system improvement with the explicit acknowledgement that once it is complete, the fares it collects will not be able to cover its operating costs. The $54B covers a period up through the 2041 end of construction of ST3, but certain taxes remain in effect in perpetuity to cover the ongoing operating costs (beyond the fare). And if the ridership doesn’t increase the way that ST3 is currently anticipating, that spread becomes even larger and we’ll face the reality of “cut transit or raise taxes even more”. So here’s the question again: why can’t the system be designed such that it will operate in the black, and why are we even willing to consider committing to something that doesn’t? A) No transit agency in North America reaches 100% farebox recovery. B) There’s a Laffer Curve to transit fares; when raised past a certain point revenue falls as driving becomes more attractive and ridership falls. C) Moving transit trips from buses to rail increases farebox recovery as fuel is cheaper and one driver can haul hundreds of commuters instead of one bus full. Figure I really would like to have, Ron. What’s the cost of one minute of transit operating time- maybe the average between trains and buses? Because from my experience sitting behind the wheel alongside the farebox, a lot of minutes go by while a standing load gets fare information from the driver. Of one of several dozen Tunnel buses. Per minute. The world has long since worked out fare inspection and proof of payment. Wonder what a steel furnace would give us for a dump-truck load of those fareboxes? To work, you would need to drop the property tax subsidy for roads, and replace it with a much higher gas tax. No private transit system has survived in any city with such heavily subsidized roads. A new 2016 Hyundai Accent costs just under $15,000. Instead of spending $54B on mass transit, that each rider would have to pay to use and each person (rider or not) would be paying taxes to keep operating, we could just buy each resident (man, woman and child) of the greater Seattle area a brand new 2016 Hyundai Accent. Another way to describe the enormous cost of this project is to put a “-1” in front of both sides of that equation. You’re asking us to buy one Hyundai Accent for each member of our family, and never receive the car but instead mass transit will be improved. And we’ll still have to pay to keep the mass transit running and we’ll have to pay some more if we want to use it. No thank you, I’d really rather keep driving. Last rental car I had was a Hyundai. Liked it a lot. But say a four car LINK train carries 400 people. Which I think still leaves seats. Would mine have a kitchen, a bunk, an exercise room, and a toilet? When your proposal wins, have to ask my dealer about extras. Per consumer reports, the average lifespan of a new car is 8 years. So, this hypothetical bonanza of new cars would be largely crushed for scrap in under a decade. In comparison, Portland is just now refurbishing their original light rail rolling stock, delivered in 1984! And look at Boston, still running light rail through tunnels built in 1897. Long term capital investments made by a region are a wholly different beast from individual investments in depreciating assets and can’t be judged on the same basis. That’s the cost of the vehicle alone. Care to spend $54 billion in buying cars for everyone, and then spend an additional $80 billion for additional highway capacity to put them on? Care to spend $54 billion in buying cars for everyone, and then spend an additional $100 billion for additional highway capacity to put them on? Apologies. Some sort of web site glitch. It said the web server was no longervavailable and so I posted again. KDan, I appreciate your blunt honesty that you see this as car drivers vs. transit riders. I’ve been wanting an honest opponent making honest arguments, ala Tim Eyman. The we’re-for-transit-but crowd has marginalized itself from being taken seriously by taking the non-credible position of we’re-for-transit-but. The weakness of your no-growth position is that population growth is a reality, and we can’t wish it away or legislate it away. Nor is there a workable possibility of tanking the local economy so badly that nobody will want to move here. Given the inevitable population growth, the question is then where to allow people to live, and what additional transportation capacity will be needed as a result. I don’t want to pay any more taxes to fund increasing freeway capacity. But I’m finding it easier and easier to get around, thanks to investments in bus service and high-capacity grade-separated transit. Given the reality that HALA is allowing growth in urban villages, but not in the single-family diaspora, most of the people who will be moving here will be living near high-capacity transit. Most will be happy about that, and some will not. But the added long-distance trips cannot be absorbed by our already-gridlocked freeways. Light rail adds substantial capacity for moving people through transportation bottlenecks, but does not reduce congestion to be less than what it is today. Rather, it reduces congestion over what it could have been if all those people had been forced to drive cars for all their long-distance trips. The congestion already exists. Magically stopping growth right now won’t make that congestion go away. Given that reality, light rail that flies right over that congestion is the daily commuter’s friend. 1) Stop expanding. I mean the city and area, and transit too. If Seattle’s population stays the same for the next 20 years, we won’t need mass transit any worse than we do today. Obviously 100% of today’s population is willing to live here with our current transit status – those who have actually had too much move. So perhaps one thing to consider is enjoying our city and way of life, but NOT try to encourage growth. Let other cities grow instead. 2) El Segundoattle. Take the same $54B and build a new city just a few dozen miles Northeast of Seattle, where the land gets cheap. Put a boundary six miles out from that city, where all cars must be left. No personal vehicles allowed. Embrace and be the sustainable urban metropolis you want to live in, and leave the rest of us alone. $54B could build a high quality city for a million residents without need for roads. And if you only spend that same $54B on it, you could *give* the property away. Or you could spend $154B on development and have $100B of that come from revenue of selling condos and office space, both of which would be a huge savings over Seattle current rates. Seattle 2.0, or El Segundoattle. 1+2 = even better than ST3. The problem with that is that all the employers and businesses and cultural events that make Seattle so attractive are here, not around Segundoattle. I’m sure a lot of us would love to live there if employers committed to moving there – but not otherwise. San Francisco tried #1: freeze the city in amber and keep their way of life. Turned out a desirable city still attracts people. Rich people who drive out everyone further down the economic ladder. So you could try to keep the population stable, ending up with the same number of people, just a wholly different composition. Not a future I care for, personally. Yes, absolutely – but if we’re building a Segundoattle just down the road (it’d probably need to be a little closer than a “few dozen miles”) which has next to no limits on growth, things might turn out different. There’s virtually nothing like that in the Bay Area. True, the entire silicon valley, marin and most of the east bay have abdicated their responsibility to grow in a way responsive to the regional growth pressures down there. That said, we don’t really have that problem, in fact we have two satellite cities, Everett and Tacoma, that have been stagnant for decades, but have the desire, urban infrastructure, and zoning to absorb massive amounts of growth. We don’t need Segundoattle, we just need high quality all day transit between those three cities! You just need to buy a giant snow making machine. One of the main reasons people want to live in the northwest is you don’t have to shovel rain. To stop expanding, we would (1) need to build a wall and not let any more easterners in; and (2) stop reproducing. The argument for rapid transit in Ballard and West Seattle is that we needed it in the 1990s when the monorail was proposed and we’ve been sufferijng without it for twenty years since then. You propose to just suffer for twenty or forty years longer. Now there’s also rapidly increasing Seattle housing prices making it increasingly essential to get high-capacity transit into the lower-cost edges of the city like Lake City and on to Kenmore. Seattle’s boundaries stopped expanding in the late 1950s. The only annexation contemplated now is White Center. Everything else is part of Burien, Tukwila, or Shoreline, except perhaps forgotten Skyway and I don’t know what’s happening with that. What?? We tried and failed to stop P&R expansion in Lynnwood, Shoreline, Angle Lake, and to lower the 1:1 parking minimums in all the suburbs. And you think we can find a place a few dozen miles from Seattle to build a dense city with no cars allowed and people will allow that? A few dozen miles from Seattle is: Everett, Tacoma, North Bend, Skykomish. No city is growing any more than the Growth Manaagement Act and PSRC is forcing them to. When Lynnwood and Federal Way and Tacoma talk about a large downtown like Bellevue, what they mean is a shower of tax-revenue windfalls from heaven. They’ll densify their downtowns hoping to snag the next Microsoft or Amazon and shopping boutiques around them. But there’s a deafening silence on upzoning the cities’ 70%, 80%, sometimes even 99% of land that’s locked into single-family. That’s the same thing that’s happening in the Bay Area, although they’re even more head-in-the-sand anti-growth there. At least Seattle is building 9 units of housing for every 12 new jobs, so the structural housing supply is decreasing by “only” 25%. Sadly, I think that I’ll be voting “No” on ST3. Yes, I am am public transport proponent – I spent the first third of my working life developing investment plans for British Rail and London Underground. But ST3 has a remarkable price tag, an odd-ball collection of projects, and (being an occasional nimby!) no tangible benefits for me (yes, I know that’s selfish!). – Light rail to Ballard seems like a no-brainer. But why does it need its own downtown tunnel? There are ways to better exploit the capacity of the existing tunnel. – Light rail from Kirkland to Issaquah … why??? Who will use it? Is there any other project with a higher benefit? – Light rail extensions further north might make sense – but it seems to be acquiring too many intermediate stops, slowing down an already slow service. – Why do we still run Sounder North? I don’t see anything here that will impact my neighborhood (upper Queen Anne). My personal transit trips are to downtown (#3, #4, #13). My regular, weekly commute is to the airport – ST3 won’t change my mode of transport (my car or Uber) since light rail is too slow, and doesn’t run early or late enough … and doesn’t really stop very close to the airport! So, given the high cost and long term impacts on taxation, I do not see ST3 delivering value for money. to me, my neighbourhood, or for Seattle. ST should break out he most effective components (eg. light rail to Ballard) and pursue them as stand-alone projects. Sub-area equity. The tax rates and projects have to be shared across the region. Ballard to downtown means it must be equalized by an equal expense in the east side someplace, and they asked for Issaquah to Kirkland. Snhomish wanted the Paine Field diversion, and Pierce wanted Link to Tacoma. The tunnel isn’t over capacity now, but the hard about 2030? 2040? Ecsuse of he length of time it takes to tunnel, you have to plan ahead for the capacity needed. East Link and ULink mean a train every 3 minutes, and that’s coming at the end of ST2 construction. They did propose a less amitious set of 15 year projects. The biggest change mplaint reported at the public meetings was that it didn’t do enough. However, due to sub-area equity spending more in Seattle means more elsewhere as well. Not an equal expense, just an equal tax rate. The subareas have different budgets levels based on how much revenue they raise, which in turn depends on their population and wealth. As for that 15-year plan, that was the same size as ST1 and ST2. Sound Transit assumed the public wouldn’t want a package larger than that. But when it proposed a 15-year system plan early this year, almost all of the feedback was to make it larger and give cities certainty when and if and where they’ll be served. That was a major flaw in ST1 and 2: they didn’t say what would happen after their 15-year increments. Would Ballard ever get Link? Would Lake City ever get Link or BRT? When will the other cities get high-capacity transit? If they don’t know, will that discourage them from following through with their upzones? Or will they upzone and then the transit doesn’t come, as happened with Ballard and the monorail. All the cities and counties said with one voice, “Do the 25-year plan. Include the things that were iffy or excluded from the 15-year plan.” The members of the public who sent in feedback said the same thing. “– Light rail to Ballard seems like a no-brainer. But why does it need its own downtown tunnel? There are ways to better exploit the capacity of the existing tunnel. *The need for the tunnel has been covered by other comments. It takes a long time because Ballard is, by far, the most difficult and demanding project of the whole bunch. *Kirkland to Issaquah because the eastside asked for it and it’s the eastside’s money. This is also very last on the agenda, so both cities will likely be very different in 2041. *North light rail stops are what Snohomish County asked for. Again, it’s Snohomish County’s money, and ST3 spends it as they asked. *Sound North – The discussion might happen when Everett Station opens sometime in the 2030s. No need to include cancelling this in ST3. And if Marysville joins the ST district, that is a rather obvious service to provide them. As far as standalone measures – not gonna happen. Seattle money goes to Seattle projects, so Seattle won’t get more by going alone. And the rest of the region isn’t gonna be willing to ship all of their cash to Seattle for their pet projects. ST3 is also an integrated system that won’t work piecemeal – but someday ST4 could possibly be separate pieces. Even if the first tunnel can fit more than two lines, it’s unwise to fill it 100% choc full before the actual demand from Lynnwood, and Bellevue/Redmond is known, and now Everett on top of that. There are people who are nervous whether the north side will have enough capacity. It’s better to have some reserve capacity available just in case. ST knows it can increase capacity in the DSTT beyond 3 minutes with capital improvements, but it doesn’t want to commit that capacity to anything but North Link/East Link. Nothing from Ballard, nothing from Issaquah. Maybe later. Westlake to Ballard itself takes only a moderate amount of time; it’s similar to University Link. The problem is it can’t open until the second tunnel is finished. West Seattle can terminate at a surface station in SODO until its tunnel is ready. Ballard can’t; it would have to terminate in Interbay, and that would be useless because people would have to transfer to the D, at precisely the point where it starts to bog down. It’s better to have some reserve capacity just to make room for eventual growth. You don’t want to be in the situation New York and New Jersey have, with all the tunnels under the river connecting the two being at capacity while a plan is developed to add more but will take a decade to complete. I live in South Park, a couple miles from the nearest light rail station. That doesn’t mean the light rail system provides zero value for me or my neighborhood. I can take two different bus routes to the nearest stations. Lower Queen Anne is closer to proposed stations, and has more frequent bus service to get to them. I’m sure you have plenty of neighbors who see the added value in having a closer connection to the light rail system, and are willing to ride a bus, or bike, or walk, to access that system. I know light rail has improved the quality of life, and access to the region, for my neighborhood. So I know the same holds true even more so for Queen Anne residents. I feel your pain, Robin. The projects are mostly corridors defined in ST2. Some are unfunded ST2 projects. Then that’s where the planning process went awry. Everybody wanted cake. They didn’t evaluate how the system would work, how cost-effective the new system would be, how service should be balanced to loads, how many rider minutes would be saved, how many net new transit riders would be gained, and many other practical questions. On top of that, ST3 is doling out money for services to be operated by other agencies with no analysis to the benefits of inclusion as well as no ability to pull the funding based on poor anticipated performance or project redefinition that won’t benefit riders. Finally, ST spent no energy assessing how to improve the existing light rail stations and tracks – and ST3 just drops in funds without ever really seeing what needs to be done for the core system. I love the ST1+2 system for the most part! The transit needs that they serve are obvious and were badly needed. On the other hand, many ST3 projects seem to be a toy train wish list to me. I think ST has failed to make their case other then saying that transit is good, trains are pretty and my town or neighborhood gets something nearby. Al, You missed ST pointing out the yuge ridership light rail is getting and will get. They’ve been talking about it all year since U-Link opened and overshot ridership projections to the point of changing up the service plan. ST adopted to the ridership reality, and changed up the service and maintenance plan. When STB complained about the freshman mistake of not having a center platform for aerial stations, ST started using center platforms in all the new stations. Ballard-downtown is a toy train? Really? ST keeps publishing ridere infor by segments only. There is not one explaining the new total system ridership. Also, ST doesn’t explain how many of those riders are already on a bus — like ST Express or on a feeder bus to Link, and that they will simply have a closer connection to the light rail. I’ve been looking for these things in presentations, documents and minutes for the past several months. It’s just not there. My reference to the toy train is simply that the alternatives in ST3 were not done with sufficient, mature analysis that optimized operations and ridership. It was more like politicians got out markers and declared where the stations and lines should go. Even if those politicians are ultimately right (like the SLU-LQA-Ballard alignment, which by the way was not studied in the corridor work but was instead forced by Seattle just this year as the only alternative), a responsible agency would have suggested enough padding in the route and station options in the measure to have provided for a serious analysis before committing to these projects! One more note on subarea equity, Robin: North King County will be paying for the items listed in this article. Taxpayers in East King County will be paying for Kirkland-Issaquah and Microsoft-Redmond. Taxpayers in South King and Pierce County will be paying for light rail to Tacoma Dome. Taxpayers in Snohomish County will be paying for light rail to Everett. Queen Anne’s taxes will support light rail to West Seattle and Ballard, plus Graham St Station and 130th St Station. The latter two are cheap add-ons to existing lines, so it is hard to argue against them on a cost basis. In the long wait (and much longer wait if ST3 loses) for light rail to Ballard, Queen Anne’s tax revenue will help pay for improvements to the D Line corridor, benefiting all the bus routes that use that corridor, not just the D Line. Queen Anne transit riders are getting almost immediate value out of ST3. No Brent, Upper Queen Anne should be getting a station. It’s an urban village, while Interbay will always be a place we travel through to get to somewhere else. ST has about as much ambition and can-do attitude as Tommy Boy. Ballard accepted a lot more density. Ballard will (voters willing) be getting the high-capacity transit to serve its ever-growing population and business district. Ballard is an urban center+. Yes, Ballard should get a station. We are talking about the absurd route to get there. ST studied a route under Queen Anne with a station at Galer because STB and 3/4 of the feedback at the Ballard open house asked for a Queen Anne-Fremont-Ballard alternative. But it was always a long shot because tunneling under Queen Anne would add immensely to the cost and require long elevators. In the end it was fiscal constraints that did it in: North King wanted Ballard light rail, a downtown tunnel, and West Seattle light rail, and even the 25-year plan just manages to fit those in. A secondary factor was the growth of SLU and Expedia’s move, and thirdly the minor development opportunity in Interbay. All of these are larger than the Queen Anne urban village, which has been trying hard to prevent any more growth on top of the hill. Just for reference, several commenters explained why we think Interbay is the better, cheaper route to Ballard, with more TOD potential, in the next piece later this week. Also, if northwest Seattle doesn’t vote overwhelmingly for ST3, don’t expect another Ballard light rail proposal to come back to the ballot. Nor is there any reason to expect that the vocal opponents of ST3 would support a smaller ST 2.5. If they don’t like paying taxes to support transit, they’ll oppose packages of any size, including ones that only pay for buses, as evidenced by the failure of county proposition 1 in 2014. Nobody on the NoOnST3 endorsement list supported the bus-only county prop 1. This blog has covered the tactic known as “BRT insincerity” at length. This article was about why ST3 is good for Seattle. Clearly, West Seattle and NW Seattle (with the exception of Magnola and parts of Queen Anne) are the major beneficiaries. But huge chunks of “core” Seattle get the shaft. And adding insult to injury, Seattle Subway is now trying to claim first priority on additional dollars for more rail in north Seattle to run east from Ballard to Sand Point. The bottom-line, from a Seattleite perspective, is that if you don’t live west of 18th Avenue, in many cases you have little reason to vote yes. That is a major intra-sub area equity issue that needs to be addressed. How would you go about equalizing it? By building nothing anywhere? By adding a bus shelter to each bus stop that lacks one instead of a significant improvement to any one particular line? You accuse Seattle Subway of lobbying for light rail between Ballard and Sand Point in a future ST bond package? Can you point to the statute that outlaws such lobbying? What outcome do you wish to see instead? More BRT instead of light rail lines? Metro 8 subway instead of the new downtown tunnel? For sub-area equity projects, what for the east side? A line to Renton instead of Issaquah? The real world, including the political conditions and constraints, is what produced this particular set of projects. ST2 provides all the spine needed. So vote no on more spine. Other regions won’t vote for Seattle-focused transit unless they get their boondoggles. So, Seattle should just go it alone and vote to fund its own transit needs. That is the outcome I wish to see. Thank you for your response that doesn’t actually refute any of my arguments. There is more to life than trolling blogs, Chuck. Seattle would have to spend a few more billion dollars to go it alone, because Seattle would then be on the hook for the entire cost of the second transit tunnel instead of sharing the cost with the other subareas as it would under Regional Proposition 1. Everett voters have turned out to ask for light rail. That is what they will get if ST3 passes. They also asked for the Paine Field Station. I was there to see them ask in large numbers. A boondoggle is something the general public didn’t ask for but got stuck with anyway. Regional Proposition 1 is an escape from congested roads that lots of people have been clarmoring for, not a boondoggle. I think there’s a typo on the map. Assuming West Seattle Junction = Alaska Junction… the next stop should be labeled Morgan Junction.